Odyssey Prestige Coaches has been in the express bus industry for many years and it is one of the bus companies which offers business class service and luxury experience to its patrons. It offers bus services from Singapore to Selangor, Malaysia. 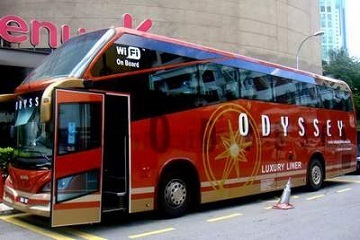 Odyssey Prestige Coaches offers 3 daily departures from Balestier Plaza, Singapore to eCurve, Selangor. The bus ticket price is SGD 43 per person. The estimated travel time is about 5 hours. 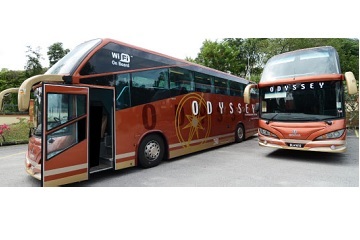 Besides, Odyssey Prestige Coaches also offers return bus route from eCurve, Selangor to Balestier Plaza, Singapore. The bus ticket price is RM 60 per person. The journey also takes about 5 hours to arrive Balestier Plaza, Singapore. Odyssey Prestige Coaches aims to offer premium customer experience to it patrons. 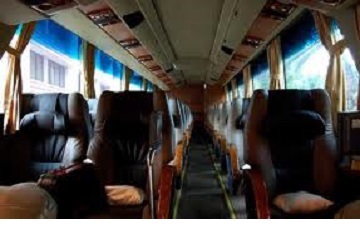 The coaches offered are 30 seaters coach and are equip with air conditioning. Odyssey Prestige’s coaches come with free wifi access on board, personal entertainment system and comfort seat to all of its patrons. Its patrons can relax in comfort and enjoy themselves in their wide seats. In addition, in order to make sure its patrons has a safe and pleasant journey; all of the bus drivers who drive the coach are professionals and well trained. Book Odyssey Prestige Coaches bus ticket now at Easybook.